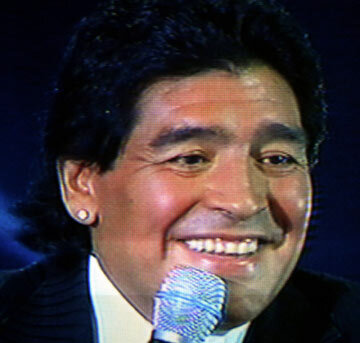 "He is no good to me like this," Argentine national coach Maradona said on television in recent days, with reference to Riquelme's current level of play. "If I cannot say how I would like him to play, I am in trouble," Maradona said, in a strong message addressed to the rebel and also to the rest of the squad. Riquelme, 30, also counterattacked on television. "I do not agree with the coach. We do not think the same way. We do not have the same codes," he said. 2006 World Cup in Germany, although he returned months later. Riquelme has a chequered past and conflict has accompanied him wherever he has gone. First it was at Boca Juniors, where he took to the limit his efforts to get the club leadership to sell him to a foreign club. Then, at Barcelona, he clashed with Louis van Gaal and Radomir Antic. At Villarreal, he fell out with coach Manuel Pellegrini and was kept off the team for several months before being traded back to Boca. Back in Buenos Aires, he remains one of the top heroes for Boca fans, although he has also had spats with team-mates, including a highly-publicized clash with defender Julio Cesar Caceres. This time, Riquelme "did not rebel, he chose to go, as every time anyone has set limits on his behaviour," the Argentine daily La Nacion said Wednesday. The decision solved a compatibility problem within the Argentine national team, in the wake of well-known clashes between Riquelme and Lionel Messi. However, Maradona did not mention Messi or another of the team's new leaders, the coach's son-in-law Sergio Aguero. Instead, he ratified his preference for one boss within the squad, captain Javier Mascherano. "I said the national team was Mascherano and 10 others, and I will stand by that to death," the coach stressed. However, Riquelme's exit removes a source of internal conflict and clears up the hierarchy within the team. "The clash Maradona-Riquelme makes it clear that the internal disputes of several players against Riquelme have reached the coach," said Argentine daily Clarin. "The petty feuds, the grabbing for territorial power, this sort of nasty conflict harms football," the newspaper added. Riquelme - a genius for some, a player who is unable to perform under pressure for others - has always been controversial.